At least 40 people were killed and dozens injured this afternoon when two car bombs exploded in the Turkish town of Reyhanli, along Turkey’s southern border with Syria. Interior Minister Muammer Güler told private NTV channel at least 100 people were injured, 29 of them critically. He said the two car bombs went off near the town’s municipality and post offices. 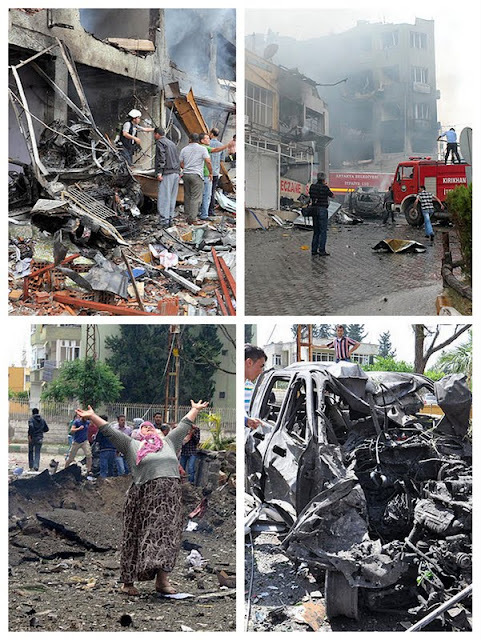 The blasts came shortly after the Local Coordination Committees for Syria -- an opposition group -- reported that Damascus government forces had fired several shells toward Reyhanli, which is in Turkey's southern province of Hatay and hosts a large number of Syrian refugees. In initial comments, Prime Minister Recep Tayyip Erdogan said, “We have recently launched a settlement process [to address the conflict in the southeast] and those who cannot digest this new period and the atmosphere of freedom in our country can be involved in such attacks." Erdogan said this week that Turkey would support a U.S.-enforced no-fly zone in Syria and warned that Damascus crossed President Barack Obama's "red line" on the use of chemical weapons long ago. Erdogan is due to meet Obama in Washington in five days’ time, on May 16. Editorially, Turkey under Erdogan is the theme of Saudi author and analyst Jamal Khashoggi’s weekly column today for pan-Arab al-Hayat newspaper. Raising his hands high in prayer, the old traditional Turkish way of beseeching God’s guidance, Deputy Prime Minister Bülent Arınç invited the group of Arab journalists he had addressed to recite al-Fatiha, the opening seven verses of the Quran. The journalists were guests of the Prime Minister’s Press Office and Anadolu Agency in Ankara, where they spent a few days meeting ruling party officials and the premier’s close aides. Arınç’s welcoming words were fervent and emotional. “Come to us, we both share the same values and aspirations,” he said. “It’s their heydays; brace for the upcoming,” I let slip. I did not see or hear members of the ruling Justice and Development Party (AKP) wax lyrical about Islamism as a form of identity politics as much as I did during my latest Turkey visit. I watched their political ascent to power since Turkey’s Islamist Prime Minister Necmettin Erbakan led his National Salvation Party and then Refah (Welfare) Party. The secular authorities repeatedly closed both down. Erbakan passed away in 2001, months before the Islamic-leaning AKP was founded. It won the following year’s general election by a landslide and has never looked back since, bringing Turkey unprecedented stability, economic growth and prosperity. Party leaders were previously cautious not to overplay their Islamic streaks. The “Deep State” was lying in wait for them. Furthermore, the Ergenekon trials of people long believed to have been pulling the strings of power are underway. I looked at an Egyptian colleague, hoping he would have heard the conversation. What İşler said is what Egypt needs. Is it so, or is it the Arab Spring? Haşimi is close to intellectuals and political activists in the region and to political parties appreciative of the AKP. He is a fervent advocate of reform changes and believes the Arab world is Turkey’s purview and vice versa. “Like you,” he said, “Turkey has had its Arab Spring in 2002,” the year the AKP came to office. “We believe in reform changes throughout the Islamic world,” he added. “We’ve been waiting for this moment for a hundred years. We’ve been left lagging behind for a full century. And it’s time for geography to reconnect with history. Beşir Atalay, also a deputy prime minister, was irked when an Arab researcher talked of a planned Turkish-Israeli-American alliance, given the Israeli prime minister’s ice-breaking phone call to Erdogan, which was brokered by Obama. It seems a different and strong Turkey is heading our way, one that has just zeroed out her debt to the International Monetary Fund. She believes in change in the Arab world, which she divides into two groups – one where she feels accountable for change and another she classifies states according to their respective economic weight and political clout.